The fat-burning modes on cardiovascular machines have created confusion among gym-goers. People tend to exercise in the low-intensity “fat-burning” mode under the impression that they will burn more fat. Although that is partly true, the total amount of calories you burn is more important than which calories are burned. Once you have a basic understanding of how energy is used, you may you see more results from your exercise routine -- and enjoy it too. Carbohydrates and fats are two of the three types of energy sources, the other being protein. All three sources must be processed and converted into energy before your body can use them. Carbohydrates are converted into energy the quickest, so the human body relies heavily on the easy access of stored carbohydrates as its main energy source. Fat isn’t as quickly available as carbohydrates; it must go through additional processes before being converted into energy. Protein contributes very little energy. It comes down to the calories you eat and the calories you burn. Fat calories are burned during low-intensity, prolonged exercise, but fewer overall calories are burned during this type of exercise. According to fitness expert Jessica Matthews, one hour of low-intensity exercise burns 200 calories, 120 of those from fat. However, exercising at a high intensity for an hour burns 400 calories, and 140 of those are from fat. Not only does this burn more fat calories, it also burns twice the overall calories. To burn both fat and carbohydrate calories, mix up your workout routine. 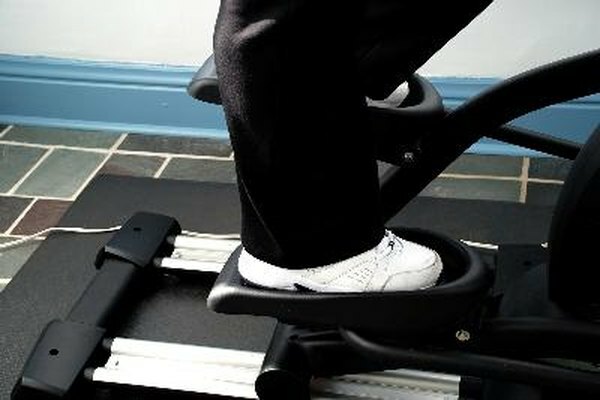 Vary the speed and incline on the treadmill or elliptical machine. This will prevent a plateau in weight loss and performance by keeping your body from adapting to the same exercise day in and day out. The varying intensity improves the body’s recovery process and keeps it interesting. Change cardiovascular machines. If you normally walk or run on the treadmill, try the rowing machine for a total-body challenge. Implement a circuit program by spending 10 minutes doing a hill-climb on the treadmill, 10 minutes on the stationary bike and 10 on elliptical machine. Rotate to different types of machines each time you visit the gym. Other activities include swimming, hiking or playing tennis. Keep challenging yourself and increasing intensity when your program gets too easy. Start a strength training program two to three times per week focusing on the major muscle groups. More muscle mass means more calories burned, even while at rest. Many challenging strength training exercises can be done with body weight alone. Incorporate the help of a nationally certified trainer occasionally for new ideas or routines or attend a strength training class using resistance bands, hand weights or body weight. All of these promote varying levels of intensity for burning fat and carbohydrate calories. Physiology of Sport and Exercise: Jack H. Wilmore et al.